5 Ways to Prevent Forest Fires | Mr. Tree, Inc.
Forest fires are scary; that’s not a secret. But, many are very preventable with a little extra care and attention when out in nature. As you can imagine, we here at Mr. Tree want to protect our Oregon trees as much as we can. And one way of doing this is by preventing forest fires, but we need your help. Let’s go over what you can do this summer when you’re out enjoying our gorgeous backyard. The forest is a beautiful thing, and we want you to go out there and take advantage of nature’s glory. In fact, we encourage everyone to go camping. But, it is vital that you remember to be wary of your campsite, and especially your campfire. Be sure to extinguish your campfire not only when you go to sleep, but also whenever you are not at your campsite. A campfire should always be monitored. Additionally, it needs to be contained. Make sure that nothing flammable is near the fire. All it takes is a couple of seconds for a spark to catch onto something flammable, gain steam, and then spread to our Oregon trees. Additionally, check the local weather conditions. If it’s too windy and trees are swaying, that can be a higher risk and you may not want to start a campfire. We must stress that you need to make sure to triple check that your campfire is completely out; never just assume that because you threw water on it that you’re set to leave. To further ensure it is out, smother it with dirt before walking away. Also, be sure to obey nearby signs. If you are staying at a designated campsite, read the postings as you enter. 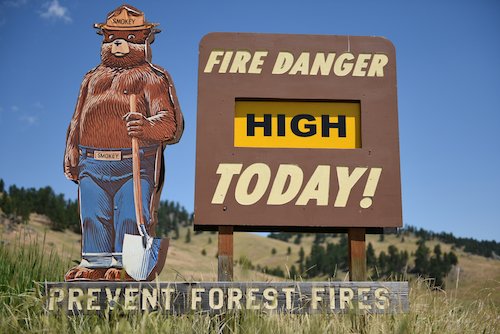 It will likely notify you of the current fire danger and if campfires are currently allowed. Yes, it’s ideal to set up a fire all year long, but if the sign indicates no, there is a good reason. Not that you should be smoking anyway as it is bad for you, but please do not to smoke when you are in the forest or around trees. If you must, use extreme caution. Make sure that all used matches and cigarette butts are put out in a closed container or a cup of water. Do not just throw it on the ground. Additionally, be extremely careful when you are lighting your cigarette as you do not want your lighter or match to catch on to something else nearby; ensure that you are only lighting your cigarette and quickly put it out. This may seem like common sense, but we must stress it anyway – make sure that all lighters, matches, and cigarette butts are properly disposed of. You don’t want a silly mistake to be the demise of your fun weekend. Before setting off fireworks, please first make sure that it is legal in the state where you plan to set them off. For instance, here in Oregon, you may purchase fireworks from permitted retailers and stands. However, the use or sale of fireworks that fly, explore, or travel more than six feet on the ground or twelve inches into the air are forbidden. If you are setting off fireworks, please do not do so near any trees. You may think to yourself, “This isn’t traveling more than six feet and won’t cause any danger,” but that is something you really should not assume. As we were reminded last year when one teen accidentally caused the Eagle Creek fire, one “harmless” firework can cause a lot of damage. His one mistake caused him great suffering and has left much of the affected area still inaccessible. Be sure to have water on-hand – whether that water is in the form of water in a bucket, a hose, or a fire extinguisher. Wetting the ground prior to setting off fireworks also helps. Again, this may seem like common sense, but do not let children go near the fireworks or use them unsupervised. And, if it is windy, refrain from using fireworks as the wind will carry them farther than you expect. Yes, cars can start forest fires as well. Do not park your hot car on dry grass. The heat will spread to the grass, which can unintentionally lead to brush fires. Additionally, be sure that your vehicle is not leaking any fluid, especially when going off-roading to get to out-of-the-way hiking or camping locations. While this seems simple, accidents do happen and can be avoided with some added diligence this summer. If you are using a larger vehicle, such as an off-road vehicle or a tractor in a forest area, be sure that you have spark arrestors on these items. All cars and trucks should also have the proper exhaust systems when they are being operated in a forested area. Does this seem like common sense? It should, but it is important for us to stress anyway. If you are going to be starting a fire in the forest or near any tree-lined area, have a fire extinguisher near you. As we all know, accidents do happen and often when we least expect. If you’re heading out to the forest this summer bring an extinguisher along and know that you’re doing your part to ensure our forest remains the vibrant backyard we enjoy so much. It’s also important for you to know your local emergency telephone number in case the fire extinguisher is not enough and your fire becomes uncontrollable. Forest fires can be scary and extremely destructive to a community. The good news is that they can often be prevented. But, in order to prevent them, we do need your help.